It’s been lonely blogging that the Euro Area economy was not nearly as bad as consensus reckons, even consensus amongst our fellow Market Monetarists. But the data has consistently shown Euro Area NGDP growth doing better, and at least as good as the long-term average. The long-term avearge is dragged by the twin recessions and growth is still way below trend but it is far from hopeless. The Euro Area PMIs for July out today are quite good in themselves and especially good given they were taken after the Brexit shock and incorporate the impact of the growing Italian bank crisis and the terrorist tragedies in France. The Composite Index may be at 18 month lows but it was expected to be much worse that the still positive 52.9 reading. Monetary policy is just about as easy as it could be given it is operating with the handbrake firmly on. The ECB balance sheet is roaring up and taking Euro Base Money with it. Draghi has said that he will keep the policy of QE for as long as it takes. There is constant worrying chatter about the challenges of finding appropriate stuff for the ECB to buy – and this is great news. It is the “Chuck Norris” effect in action as it demonstrates the ECB’s commitment to QE on top of the actual financial asset buying it is undertaking. 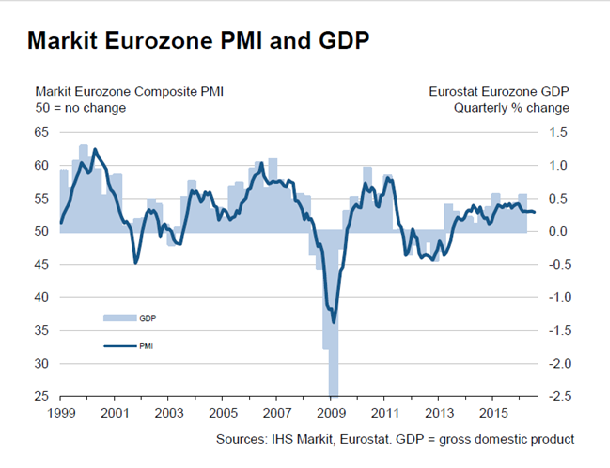 It will make economic actors begin to believe nominal growth really will accelerate even if the ECB doesn´t take further concrete steps (or “steppes”). The hot potato monster may be stalking the land again. German and Spanish NGDP growth rates are a great cause for hope. Draghi must know Italy desperately needs stronger NGDP growth to help solve its bad debt problem as our friend Lars Christensen has shown in a “one graph” version. If Italy doesn’t get it then the EU may soon suffer another exit. Releasing the handbrake represented by the foolishly self-defeating 2% inflation ceiling would mean that none of this money growth is actually necessary but, hey-ho, that is the way of the world with inflation ceilings or inflation targets that morph into ceilings. This entry was tagged ECB, Hot Patato, James Alexander, Lars Christensen. Bookmark the permalink. I live in the concrete steppes. I like it here, the weather is nice and while we may lack imagination, most of the residents are reasonable down to earth friendly types. We like it when the central bank uses concrete steps cause we see where they are going. I like concrete NGDP Targets and then we won’t need steps concrete or otherwise. Chuck Norris will do all the heavy lifting.